International Dancehall artist Konshens and his longtime girlfriend Latoya Wright, tied the knot at a private beach ceremony in Miami on Sunday November 19, 2017. The guest list comprised family members and close friends. 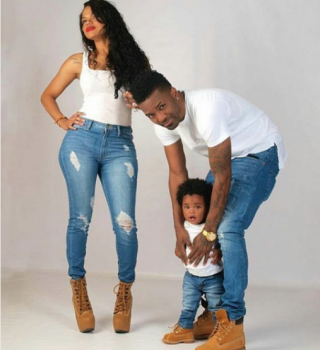 Latoya, is the mother of his son Liam, and the two got engaged back in 2014. They’d been dating for 6 years. Konshens, 32, whose given name is Garfield Spence, emerged on the scene in the late 2000s. Formerly part of the duo SoJah, with his brother and recording artiste Delus, his moment came with the hit Winner. Sadly, Delus (Delmark Spence) died in June 2016 of what appeared to be a single gunshot wound to the head. Konshens’s other hits include Gal A Bubble, Winner, Do Sum’n and The Realest Song. Signal Band… Youngest & Baddest!! !